Wine Glass of the Month Collections Club - The perfect gift for the wine lover on your gift list! 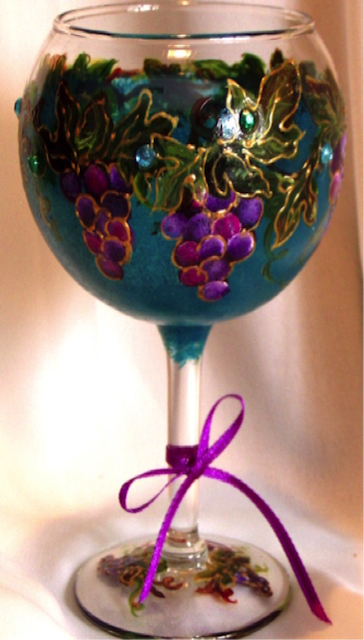 Give a gift of an exquisite, one of a kind, hand-painted wine glass each month of the year (or select every three months)! I create special designs for each month, detailed and embellished with rhinestones and/or gems, as would enhance the design. You can choose from white, red or "mix-it-up" (both styles) wine glass styles. Subscription options detailed below- Choose from monthly or quarterly plans. I am passionate about creating works of art on glassware. Your recipient will receive a quality, exciting and beautiful wine glass and a personal note from you. Examples shown, but not specific. Your note will be handwritten on a gift card. All orders are shipped in the first week of the month (excluding January, when shipping is done the second week of the month). Wine glasses are painted with non-toxic paint, then "fired" which permanently fuses the paint to the glass, creating a beautiful, durable finish of the designs. Hand-Washing is recommended due to harsh detergents which tend to etch glassware. FREE Shipping within the continental United States, only. PA 6% State Sales tax for sales to PA residents. "Artist Choice"- The most popular choice- featuring designs from my heart to theirs! Month/Occasion Choice- Featuring wine glasses with designs specifically for each season/month/holiday. Flower of the Month option. **** FREE SHIPPING!! **** Be sure to select the "Free Shipping" option at check-out.